More about Fazer Dark Chocolate Bar - 7 oz Giving and receiving Fazer chocolate is a fine holiday tradition, and it's a very, very tasty tradition especially now that Fazer Dark Chocolate bars are available! Delicious Fazer dark chocolate boasts low lactose and a dietary fiber content of 4.7 grams per serving. 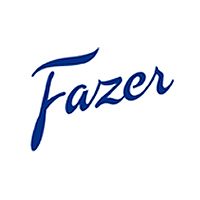 Let Fazerï¿½s decadent dark chocolate melt in your mouth. Perfect as a stocking stuffer or as a treat to yourself, this rich and creamy dark chocolate bar is sure to please your taste buds. Order multiple bars to satisfy your strongest chocolate cravings.Ingredients: sugar, cocoa mass, cocoa butter, milk fat, emulsifier (sunflower, soya lecithin), flavoring (natural vanilla). May contain traces of nuts, almonds and wheat. Cocoa solids 47% minimum. This dark chocolate is like other Fazer chocolate; very smooth and very palatable. It is only 47% cacao, so really just meets the requirements for dark chocolate, in my judgement. That said, I'm one of those people that likes 75% cacao dark chocolate, so I am a bit of a bitter nut. It is a very good quality chocolate, and a pleasure to eat. Consnot as intense as I prefer, being lower cacao percentage, but still delicious. Great price on fine dark chocolate. We love it. This was for a friend and she said it was the best dark chocolate she ever had! Fazer has become my favorite chocolate and I have lived and traveled all over! It was hard to admit that Fazer was better than some of the other European brands I was loyal to, esp these dark bars. I wasn't much of a fan of dark chocolate until someone urged me to try the 47% dark chocolate. I was immediately impressed by how the chocolate doesn't have a tangy, sour smell or taste when you first taste it. Nor did it have the overwhelming fruitiness or gritty texture of other chocolates. A scored piece off of this bar is the perfect size to let melt in your mouth and be very satisfying. I was told a long time ago it's okay to bite chocolate but you should never chew it. With this bar you can enjoy holding the taste and aroma and texture, let it develop in your mouth. It's rich without being cloyingly sweet or sugary tasting. For a dark bar it has very little grit which I like, just smoothness. These bars are big, and with careful re-wrapping I can carry one in my bag for a long time, just eating one or two pieces, for a long time. My friends have all been introduced to the Fazer dark bar, so when I bring it out, their eyes light up! I am happy to share as a Fazer diplomat of sorts, I want to tell the world, but only if it doesn't affect my supply of Fazer, haha! Enjoy! ProsSmooth, creamy, rich full chocolate taste without the sourness or fruity flavor found in other fine international chocolates. Fazer Dark Chocolate Bars have a delicious flavor, unique to Fazer, plus the dark chocolate is Good for you! I was happy to find this chocolate. I originally purchase this chocolate in Finland this summer and had wished I bought more. This is the best chocolate ever for making chocolate chip or chocolate chunk cookies. We just cut the squares into 4 smaller pieces, and use them in our chocolate chip cookier recipe, and they are the best ever. ConsYou have to cut up the chocolate squares. 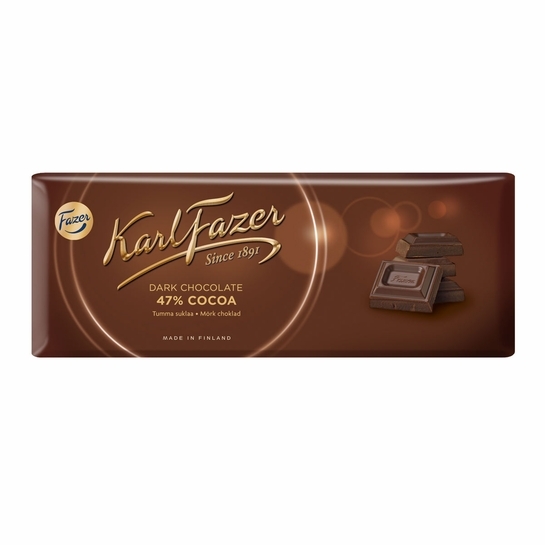 Finnish Fazer chocolate is wonderful and something I grew up with. I can eat it without getting zits (as American chocolate temds to do for me - cheaper ingredients I think). This is a sweet and creamy chocolate that is perfect when you crave a quick bite! FinnStyle shipped quickly and it was well packed! Just an amazing dark chocolate bar, something everyone must try!!! Excellent dark chocolate. It is little sweeter than TJ's 72 % dark cacao chocolate bar, just balancing out nicely the dark chocolate taste. an outstanding treat. great dark chocolate taste...a terrific chocolate flavor...probably the best dark chocolate bar I've ever had. It is easy to eat the whole chocolate bar at one sitting, reading etc. I've ordered this before and this is the best dark chocolate I've ever had. If you love dark chocolate the way I do, you will love this. It's rich and creamy and melts in your mouth. I prefer to eat it a little at a time and savor it rather than eat it all at once. Great chocolate! Taste and quality of the chocolate are supberg! For a dark chocolate this is very smooth. Fazer has another winner.It is the best dark chocolate in the world. This dark chocolate is very good, delicious and not bitter. Many of the dark chocolates advertised are bitter. bad day, too much work day. I ordered 22 of these, because I usually run out! 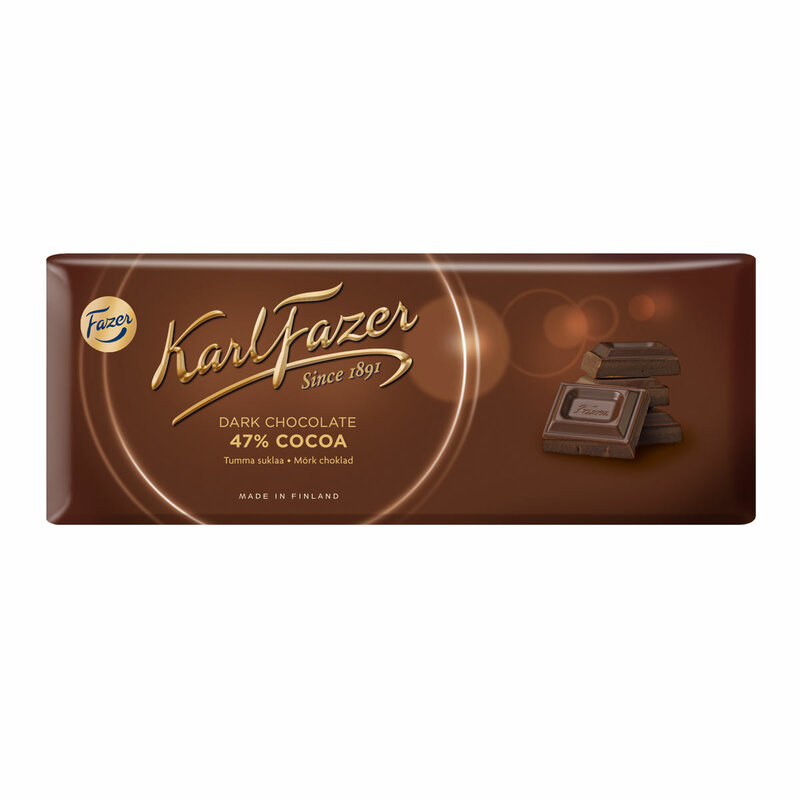 Smooth and dark, with nothing to distract from its taste, Fazer is the only chocolate bar to buy. Is the dark chocolate bar 47% or 72% cocoa? In the review it says 72%; on the bar pictured it shows 47%. I’m looking for dark chocolate 70% and higher. Thank you. It is 47% - the comment you are seeing below is referring to a different brand of chocolate bar that is 72% for comparison. What are the Ingtrdients in the dark chocolate bar? Ingredients: sugar, cocoa mass, cocoa butter, milk fat, emulsifier (sunflower, soya lecithin), flavoring (natural vanilla). May contain traces of nuts, almonds and wheat. Cocoa solids 47% minimum.